Last Friday, I started my pantry challenge with a bang by picking up a case of local Granny Smith apples at Gentile’s Produce Market. I had planned on only buying fresh fruit, veggies and milk, but I had forgotten to write down the correct date for my chicken pick up at the Media Farmers Market. So, instead of spending about $40 for this week’s food, I spent $85, $15 under budget. Because of course, I had to pick up a few soup bones for the freezer while I was at the Farmers Market. I knew this was going to be a hard challenge! The local Granny Smith apples were $.89/lb., too cheap to pass up, and buying them saved me a trip to Linvilla Orchards until later in the month. 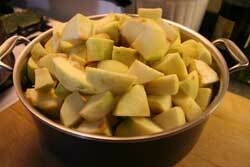 I made two batches of applesauce on Monday, and canned them in our pressure canner. I highly recommend pressure canning. It uses less water than a water bath, and quarts of applesauce only need 10 minutes at 10 pounds pressure. While I was digging potatoes last weekend, I messed a number of them up. I set them aside, cleaned them up, cooked them, and mashed them. On Monday, I made two loaves of potato bread with two cups of mashed potatoes; the recipe is in the Tassajara Bread Book . I used the potato water from cooking the potatoes to help make a loaf of our regular sandwich bread, too. My plan is to make potato bread on Sundays to have for the week. I have never made potato bread before but it sounds really good – and you can't go wrong with applesauce in the autumn. It's lovely with so many things (and on its own!!). We love to toast the potato bread slices and have it with stew. It soaks up the liquid really well.